When a fire ban is enacted, signs like this one are posted around the county. 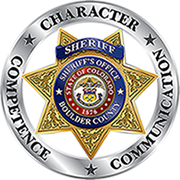 There are currently NO fire restrictions in effect in Boulder County. Fire restrictions can be enacted either by the Sheriff or the Board of County Commissioners when certain outdoor conditions are met. It is CRITICAL that visitors and residents alike do everything possible to prevent fires of all kinds. Please do what you can to protect our beautiful lands, homes, and wildlife areas from the devastating effects of wildfires. There are different levels of restrictions depending on the severity of the wildfire conditions. When we enter fire restrictions, we will let you know what types of activities (i.e. campfires, charcoal grills, fireworks, outdoor welding) are allowed and what activities are not allowed, according to the fire restriction level.